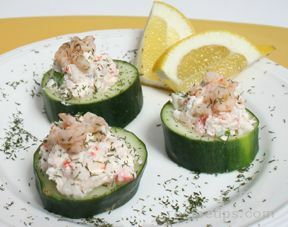 A wonderful refreshing and light appetizer. Wash and slice cucumbers into 1/2 inch rounds. Using a melon baller, scoop out the center of the cucumbers. Do not go all the way through, leave a small amount at the bottom in order to create a bowl shape. Mix the cream cheese, crab, scallions shrimp and lemon juice together. Spoon a small amount of filling into each cucumber bowl. Top each with a few tiny shrimp and sprinkle with dill.